Block stack turns up the volume on building with blocks. 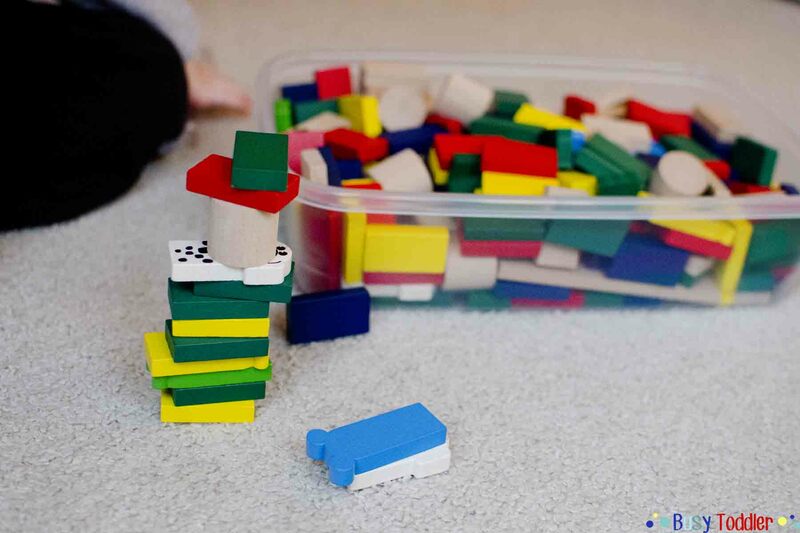 We are so massively into blocks right now at Busy Toddler HQ. Blocks are the hottest item on our toy market and my toddler (2.5 years old) just can’t get enough of them. 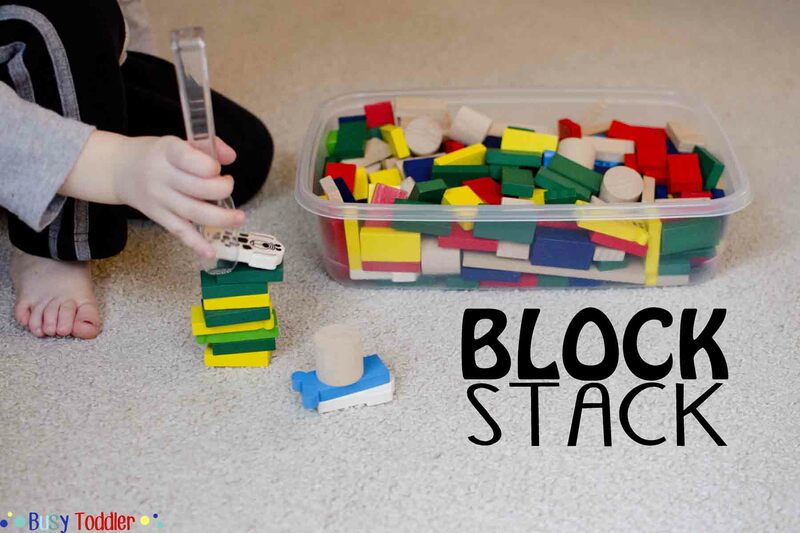 Fine by me: blocks are amazing for toddlers which is why I came up with block stack. I decided to take block building up a notch, turn up the intensity a little and make my toddler, Sam, really work for his towers [insert Mom cackle here]. Tongs + Blocks = block stack. 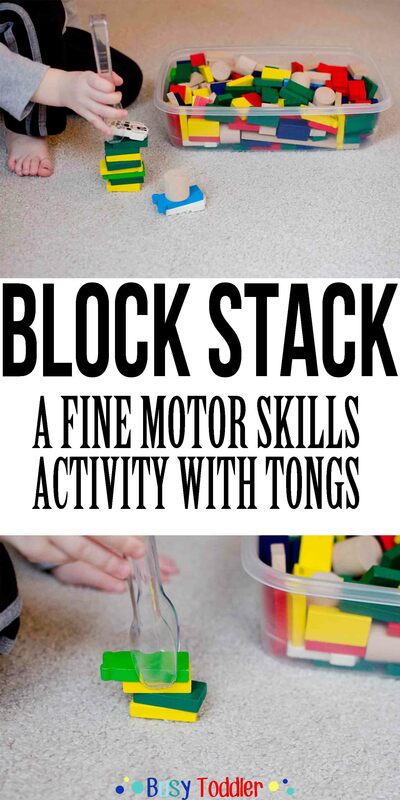 A twist on building makes block stack a hit activity. 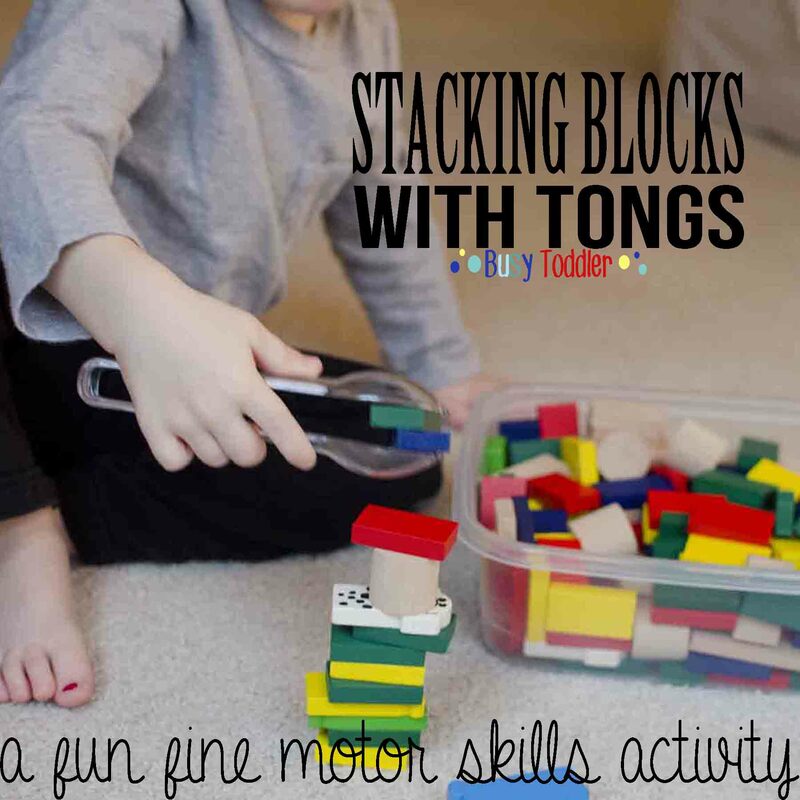 Block stacking with tongs is tricky tricky! I promise this may look easy but it is not. 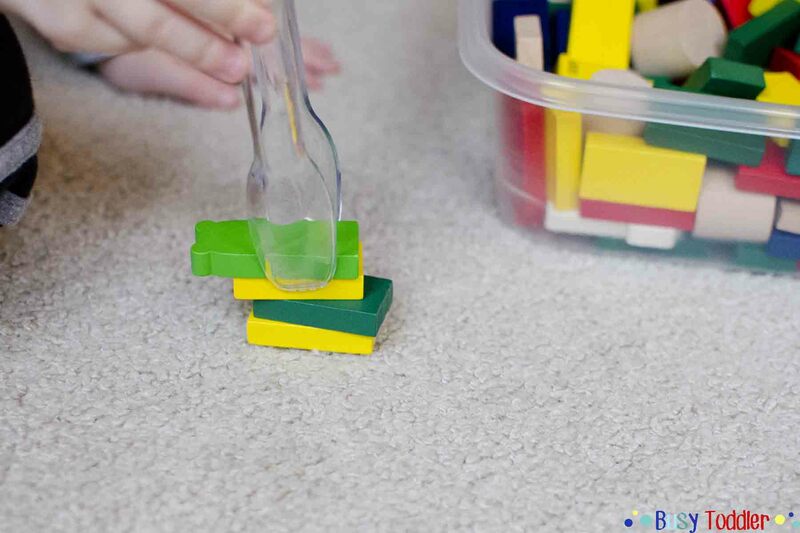 The frustration level is just right for this toddler activity – it’s definitely not an easy one! For this round of Block Stack, we used our current favorite toy: Go-Go Dominoes by HABA. These dominoes are the.best. They are just the right size for toddler hands and toddler tongs making them the perfect supply for this toddler activity. PS: How many times can I say “toddler” in one paragraph? Should I keep going or let it drop? I dumped all of our Go-Go Dominoes into a giant Tupperware-type tub – it has a lid so it stores really easily. I gave my toddler a pair of tongs and modeled for him how to use those guys to capture a block at a time. Modeling how to do block stack with tongs was key to show Sam how to position the tongs to grab a domino. It also showed him that yes, stacking blocks using tongs can happen. “I just use my hands” was his initial reaction. Sorry buddy – tongs are a major player in this activity show. Once he had a little success with it, game on: he was in the building zone and suddenly it wasn’t nearly as tricky as it had been. He really liked the added challenge of using the tongs. 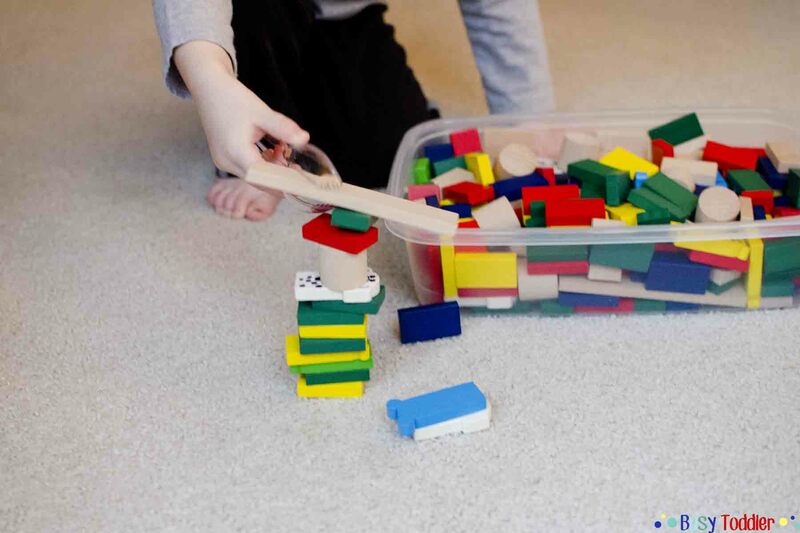 Building with blocks is one of my favorite go-to toddler activities. Add in tongs and we’ve just upped the ante big time. Now it’s a fine motor skills game with loads of concentration and problem solving. 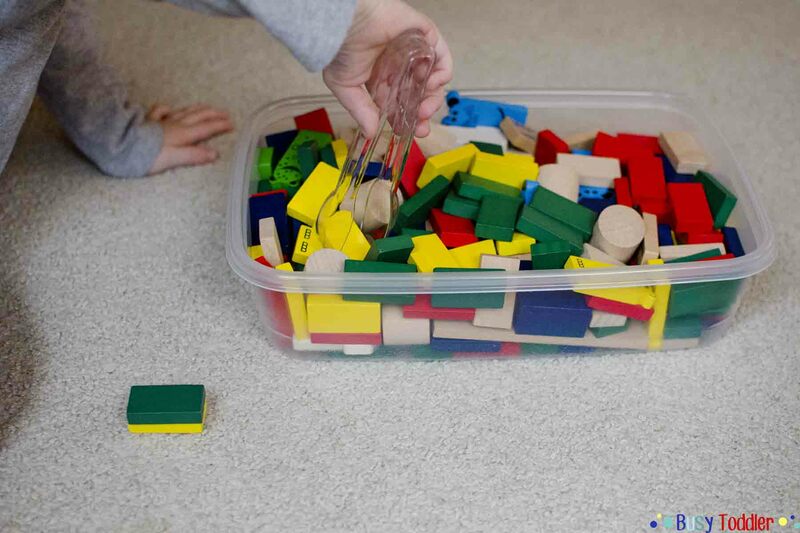 Having a toddler use tongs to pinch and grasp the blocks is an Occupational Therapists dream. As he worked on building his little block tower, I started calling out colors for him to find in the tub of dominoes. Why not add a little color recognition into this activity? Didn’t hurt a thing and it kept him busy and hunting (and by hunting I mean quietly playing and working while I unloaded the dishwasher without anyone “helping” me…). Eventually, his tower got a little top heavy and “TIMBER!” – down came the building. We love using tongs to stack blocks and I even store an extra set of tongs with these dominoes because they go together so perfectly. If you need a way to spice up block playing, this is your ticket. We give this game two thumbs up – and I would like it noted that we’ve played block stack almost every day for the last two weeks. Now that’s a ringing toddler endorsement. Disclosure: HABA generously sent us the Go-Go Dominoes set to play with and we fell madly in love with them. All the opinions expressed in this post are completely and totally my own. I’m a retired kindergarten teacher and now a grandmother to a three year old. I live in PA and he lives out in Portland, OR where it rains for days. I was so happy to find your site and I sent the site to my daughter so she can try these fun activities. I taught kindergarten for 30 years but took a 10 year break to raise three children or I would have more years. I loved teaching these little ones and now I’m enjoying my three grandchildren. Many of your activities like threading using pipe cleaners brought back fond memories because at this time of year we would string beads and make bracelets with the pipe cleaners. Enjoy your children and wait until you have grandchildren! It is so much fun to see your son know all the names of Dora characters and even some kid songs.